Metal film resistors are used when a higher tolerance (more accurate value) is needed. They are much more accurate in value than carbon film resistors. They have about ±0.05% tolerance. They have about ±0.05% tolerance. I don´t use any high tolerance resistors in my circuits. Resistors that are about ±1% are more than sufficient. Ni-Cr (Nichrome) seems to be used for the material of resistor. 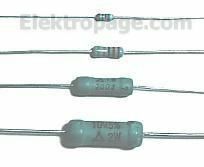 The metal film resistor is used for bridge circuits, filter circuits, and low-noise analog signal circuits.